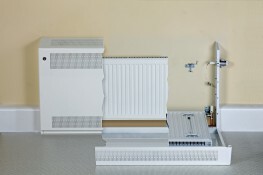 Contour Heating Products Ltd > News > Are LST Radiators Expensive? In sectors such as healthcare and education where budgets are tight and there is a drive to make money go further, the installation of LST radiators can seem daunting to some in terms of cost. To settle the concern around LST radiators and their expense, Contour has been blogging to discuss how LST radiators can actually drive up cost efficiency for your school or hospital, or any educational or healthcare environment. Contour LST radiators are designed to provide a greater level of cost-effectiveness over a long period of time. Our LST radiators use RotaRad valves. These valves mean that there is much faster and easier access available to cleaning and maintenance staff. A traditional LST radiator would typically take two people between thirty and forty minutes to clean because of the nature of opening the radiator and getting behind it to clean out any dropped items and dust. Using a RotaRad valve system, our LST radiators can be cleaned by just one person, rather than two. Not only this, but they can also be cleaned in ten minutes, rather than thirty. This immediately begins to generate a cost saving. Less staff are required to carry out cleaning and less time is spent undertaking this task. The money saved means that more staff or equipment can be purchased to improve the quality of teaching or care that students and service users receive. A second concern around the expense of LST radiators is their heat efficiency. To ensure that our radiators give the best heat output while maintaining high safety standards, Contour’s LST radiators use an interior coating of Kingspan foam. The foam works by reflecting the heat generated out into the room and stops it from being lost into the brickwork behind the LST. This makes LST radiators both cost and heat efficient. This is because you won’t have to crank the temperature up to make up for lost heat! This results in lower heating bills which reduces the lifetime cost of your LST radiators. Contour LST radiators provide a long-term cost saving to customers thanks to their efficient heat output and cleaning cost design. Our LST radiators are designed with RotaRad valves. These give easier access and reduce the time required to clean and maintain the LSTs. Over time, this reduces the number of staff and hours required for cleaning which creates a cost saving over time. Similarly, LST radiators are designed to improve heat efficiency with a layer of Kingspan foam on the interior which helps to project heat back out into the room. Over time this creates a cost saving as heating bills will be lower as a result.